Making a dichroic foil pendant from fused glass and dichroic coated copper foil. This item is made from fusing glass and CBS (Coatings By Sandberg) dichroic foil coated copper. It is easily removed from the backing sheet and crushed by hand for use in this project. During transport some will have flaked off the sheet. By rubbing the bag across the edge of a desk the remainder of the foil will come loose. Cut open the bag and remove the sheet, keep the flakes in the anti-static bag. • Clear and black fusing glass. Step 1. Cut a piece of black glass 1 3/4" x 1 1/2". Cut a piece of clear slightly larger for the cap. Clear can be used for the base as well. Step 2. Crush flakes between your fingers, this can be done inside the bag if you wish. The flakes for this item has been coarsely crushed. Step 3. Sprinkle crushed flakes on base and cap with clear as per the following photo. Keep flakes back from the edges of the so that the cap can fuse completely. Return unused pieces to the anti-static bag. Place on prepared kiln shelf and put in fusing kiln. Step 4. Bring fusing temperature up to about 1500° F (816° C) and fully fuse. Do not over heat or the flakes may burn away. When fully fused, switch off kiln and cool to room temperature. 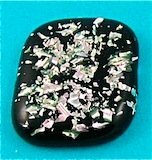 This product comes in a number of colors and can be used in a range of fusing projects. For additional information regarding the use of this material please visit our glassworks page.